Union front groups are hiring for positions that require long, irregular hours to help champion legislation that will eliminate jobs that require employees to work long, irregular hours. The United Food and Commercial Workers union (UFCW) has been waging a battle against retailers to put an end to flexible scheduling practices that employers use to balance their part-time and hourly workers. They have found many allies among congressional Democrats, including Rep. George Miller (D., Calif.) and Sen. Tom Harkin (D., Iowa), the chairman of the Senate Health, Education, Labor, and Pensions Committee (HELP). The pair introduced legislation on July 22 that would hinder managers’ ability to schedule their workforce. "Despite being employed, too many hardworking people don’t have a stable schedule and consistent wages. Instead, schedules change constantly, so workers can’t predict their income or plan their lives. This wreaks havoc on working families and jeopardizes their economic security," Harkin said in a release. "The Schedules That Work Act would help workers better manage this balance while still respecting the needs of businesses." The law, which would restrict companies from setting their own schedule, may hurt some of the labor unions that have championed its creation. The UFCW’s Retail Action Project (RAP) advertises jobs with flexible schedules that appear to violate the spirit of Harkin’s legislation. One of the main qualifications for a lead organizer position at RAP is a "willingness to work long, irregular, evening, or weekends as needed." The UFCW includes requirements to work weekends, long hours, and extended travel periods at the whim of the labor group, according to a job post on UnionJobs.com. 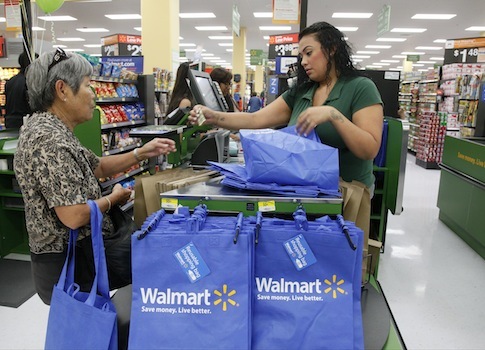 UFCW subsidiary, OUR Walmart, has scoffed at allowing employers such flexibility in the past. The worker center issued strong support for the Schedules That Work Act when it was introduced. "The legislation—the Schedules that Work Act—is designed to ensure that workers … have a voice in their work schedules, the predictability and stability they need to meet the dual demands of work and family, and a fair shot at achieving economic security for themselves and their families," the group said in a release. "Walmart—the standard-setter for jobs in the retail industry—has created an unfair norm of erratic, part-time scheduling, preventing low-wage workers from holding down second jobs, arranging child care, going to school or managing health conditions." Neither RAP, nor the UFCW responded to request for comment. Labor watchdogs do not begrudge the union for seeking flexible workers that are needed to work irregular hours, recognizing that some jobs cannot be properly performed on a 9-5 schedule. But those unions should not push for laws to punish companies that seek the same flexibility, said Ryan Williams, a senior adviser at Worker Center Watch. "Big Labor is trying to have it both ways. They want to force onerous scheduling regulations on job creators that unions and union front groups refuse to follow," he said in a statement. "People are able to see through Big Labor’s blatant hypocrisy and realize that union bosses are out to help themselves instead of helping employers create jobs and putting people back to work." This entry was posted in Issues and tagged Tom Harkin, Unions. Bookmark the permalink.